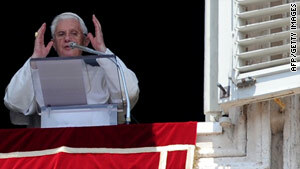 Pope Benedict XVI adresses the crowd during his Sunday Angelus prayer at the Vatican. (CNN) -- A raid at the headquarters of the Catholic Church in Belgium by police investigating child abuse was "deplorable," Pope Benedict XVI said Sunday. The pope expressed his "closeness and solidarity in this moment of sadness, in which, with certain surprising and deplorable methods, the searches were carried out" in a letter to the head of the Belgian Bishops Conference, Andre Joseph Leonard. Police were searching for documents related to allegations of child abuse, a spokesman for the Brussels prosecutor said Thursday. The Vatican said Friday it was shocked by the raids, alleging that two cardinals' tombs were violated in the raids in the town of Mechelen. "We also express our regret at some of the infringement of confidentiality, that those victims on whose name the raid were conducted have the right to," the Vatican said in its statement Friday. The Vatican also reaffirmed its "strong condemnation of any sinful and criminal abuse of minors by members of the Church" and cited "the need to repair and confront such acts in conformity with the law and teachings of the Gospel." investigation into the abuse of children by church figures, prosecutor's spokesman Jean Marc Meilleur said on Thursday. The Catholic Church faces allegations of child abuse by clergy across at least half a dozen countries, including the pope's native Germany, as well as Belgium, Ireland, Austria, the Netherlands and the United States. CNN's Caroline Paterson and Hada Messia contributed to this report.